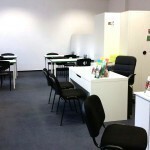 Our focus lies particularly on top quality education for adults with a professional background. Achieve your goals with language! Together we form the linguistic basis for your future! 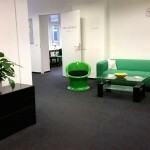 Visit our modern language school in central Berlin and learn in a fun and comfortable environment. 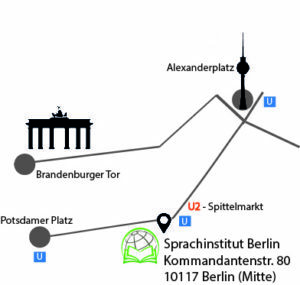 SPRACHINSTITUT BERLIN is located within a 3 minute walk from the ubahn station Spittelmarkt (U2), located 3 stations away from Alexanderplatz and 4 stations away from Potsdamer Platz. Within the neighborhood of our language school there are bakeries, supermarkets, and numerous restaurants for you to enjoy. 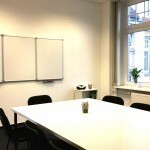 Our bright rooms accommodate a pleasant and welcoming class atmosphere. Interactive whiteboards, comfortable seats and a quiet environment all let you concentrate on nothing but your coursework. Come by and see for yourself! The quality of our courses is largely dependent on the satisfaction of our employees and teachers. 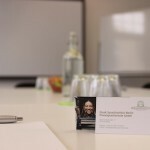 For this reason our language school offers our colleagues a fulfilling job with flat hierarchies, direct communication and more varied, social interaction. 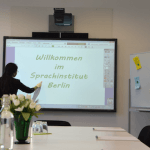 SPRACHINSTITUT BERLIN is a school where diverse learning and teaching methods take place. We want to learn from each other and be successful together. We believe in both the lifelong learning process of each person, and the human interaction it caters. For us, the individual with his or her personal development is crucial to the learning process. Therefore, we very much value the wishes and needs of all people involved in the learning process. Our high standards of service, and diverse course selection are developed mainly to inspire our customers. We support our customers in achieving their personal goals. Hongera sana kwa jitihada hizi. hakika dunia ina utajiri wa utamaduni katika lugha. Kutoa fursa kwa watu mbalimbali kujifunza lugha hizo si tu kunawawezesha mtu mmoja mmoja kunufaika na utajiri huo, bali kunaongeza mshikamano kati yetu wanadamu. Naitakia kila la heri shule hii. Tolle Atmosphäre. Prima Lernstoff von sehr sympathischen Dozenten. 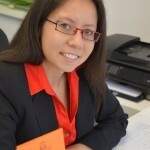 Rundum professionelles Sprachinstitut mit exzellentem Personal, moderner Ausstattung, guter Lage und vor allen Dingen zielorientiertem, fachspezifischem Unterricht. Top!